Did you know that the first crossword puzzle was created by Arthur Wynne and published on December 21, 1913 in the New York World Newspaper? Wynne’s puzzle was diamond shaped and contained no internal black squares. However, it was so popular with readers that within a decade crossword puzzles were featured in almost all American newspapers. We all know a crossword lover; some even get the newspaper for the sole purpose of doing the crossword. So on December 21 let’s celebrate National Crossword Puzzle Day the best way we know how … find one you like and start filling in those squares! Sometimes two heads are better than one. If you’re new at doing crossword puzzles, you’re probably going to struggle a little bit. Make it a bit more fun and do the puzzle with a friend! You can even team up with a significant other for more crossword puzzle fun. It’s a great way to find out what weird facts your SO knows! Thank goodness for the internet; there are so many sites that offer free crosswords! There’s basically an endless supply at your fingertips, so you’re sure to never get bored. Pick from ones that suit your ability and interest level, or try to challenge yourself with one that’s a bit more tricky. Can you complete it? Only one way to find out! Are you a mycological expert? Do you know everything there is to know about geology? Find a subject that you're an expert in and try completing a crossword about that. You’ll be able to figure out tons of clues based on your prior knowledge, and you might even complete the entire crossword! You’ll feel great and start expanding your knowledge in a field that interests you. 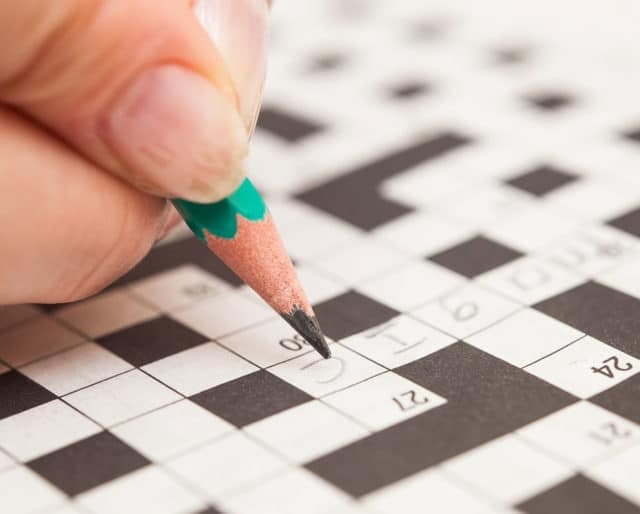 Studies have shown that doing crossword puzzles prevents dementia, improves verbal skills, help practice problem solving skills, helps the brain identify patterns, and improves your ability to do trivia. That’s a lot of wins — and a lot of reasons to become a master crossword puzzle solver. Up your crossword puzzle game and win at trivia the next time you play with your friends! We do a lot of waiting in our lives, whether we’re waiting for the bus on our daily commute or waiting a flight to leave. There’s a lot of potential to be bored! However, there’s a way to engage your mind while making time fly by. Do you see where we’re heading? Crossword puzzles are portable and cost nothing. They’re perfect for taking everywhere with you! What could be better? Crossword puzzles help you learn about new subjects. It’s hard not to get stuck on a question, unless you’re a crossword puzzle fanatic. And we’ve all been guilty of looking online to find the answer. However, even though that’s technically cheating, when you search for answers you learn new facts and expand your mind. Crossword puzzles are meant to stump you, so you’ll always learn something new! Who cares if it’s something you didn’t want to know in the first place?